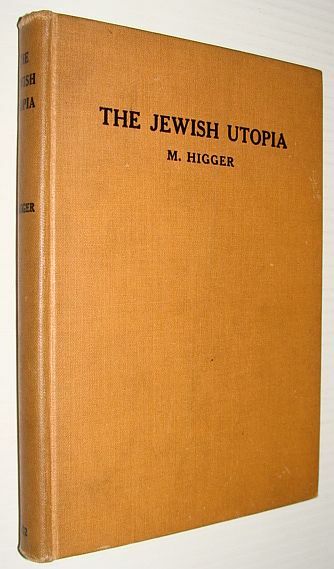 [...] The two quotations indicate the key-note to the philosophy underlying the rabbinic Utopia. An ideal society among the family of nations, as visualized by the prophets, although not realized as yet, will ultimately be achieved. Nations will come, nations will go. Dogmatic Christianity has come, dogmatic Christianity will be gone. "Isms" have created nations, " isms " will destroy nations. Capitalism has brought happiness and woes to mankind; communism may bring its paradises and hells to mankind. Doctrines have shaped the destinies of peoples, doctrines may bring destruction to peoples. But the millennium will come only when the nations of the earth direct their efforts toward the visions of the prophets, and make function the teachings of Amos, Isaiah, and Micah. Only then will the day be ushered in, in which the ideal world and our present era will, in the language of a Palestinian Amora, " kiss each other, as a sign of the arrival of the new era, and the departure of the old ". Unlike Plato's Republic, where the ends sought are political rather than spiritual, the motive of a Prophetic-Rabbinic Utopia is the spiritual perfection of human society. In the Republic, to be sure, the supreme virtue in the ideal commonwealth is Justice. But Plato is chiefly concerned with what will hold the ideal city together. The rabbis, on the other hand, are mainly interested in that ideology which would hold the whole world, or the Universal State, together. The ideal behind the Jewish Utopia is spiritual and ethical harmony. [...] The underlying Jewish attitude is, as Abravanel has pointed out throughout his work, Mashmi'a Yeshu'ah, that the major predictions of the Prophets concerning universal peace and happiness were not realized during the Second Commonwealth; nor have they been fulfilled by Christianity. The basis of the Rabbinic Utopia is, therefore, the millennium pictured by the prophets. The rabbis occasionally give a coloring of their own; but this plant rooted in prophetic soil was watered with the moisture of Israel's age-long experiences since the days of the prophets. What are these roots of the prophetic idea of a paradise an earth, as, understood by the rabbis? The answer to this will be the burden of the following chapters. [...] To understand the rabbinic conception of an ideal world it will help us if we imagine a hand passing from land to land, from country to country, from the Persian Gulf to the Atlantic Ocean, and from the Indian Ocean to the North Pole, marking "righteous" or "wicked" on the forehead of each one of the sixteen hundred million inhabitants of our earthly globe. We should then be on the right road toward solving the major problems that burden so heavily the shoulders of suffering humanity. For mankind should be divided into two, and only two, distinct and unmistakable groups, namely, righteous and wicked. To the righteous would belong all that which God's wonderful world is offering; to the wicked would belong nothing. In the future, the words of Isaiah, in the language of the rabbis, will be fulfilled: Behold, My servants shall eat, but ye shall be hungry; behold, My servants shall drink, but ye shall be thirsty; behold, My servants shall rejoice, but ye shall be ashamed.This is the force of the prophecy of Malachi, when he said: Then shall ye again discern between the righteous and the wicked, between him that serveth God and him that serveth him not. [...] The conception of an ideal Universal State in which only the upright and just prosper, is well described in a Utopia, pictured by the Prophet Elijah, according to a rabbinic version: "Elijah said: I behold all the wicked of the earth disappeared, and all the righteous in control of the land. The earth, planted with all kinds of good things, lies before the righteous. The tree which God has planted is standing in the midst of the Garden - as it is said, And by the river upon the bank thereof, on this side and on that side, shall grow every tree for food, whose leaf shall not wither, neither shall the fruit thereof fail. Ships are coming from En-gedi even unto Eglaim, carrying riches and abundance for the righteous. I behold a beautiful, large city, coming down from heaven. It is the city of Jerusalem, rebuilt, and inhabited by her people. The city is situated among three thousands towers. The space between each two of the towers is twenty "ris". At the end of each ' ris' there are twentyfive thousand cubits of emeralds and of precious stones and pearls. I behold houses and gates of the righteous with their proper door-frames. The door-posts are of precious stones, and the treasuries of the Temple are open, even unto their doors. And learning and peace prevail among them". That the righteous should be the only ones entitled to all the bliss and happiness in the ideal world, one ean easily infer from the glorious future which the rabbis picture for the just and upright in the world to come. "The Holy one, blessed be He ", says R. Eleazor in the name of R. Hanina, "wiIl place a crown upon the head of each of the righteous." The nineteenth century" maskilim ", or Jewish radicals, used to exercise their wit by ridiculing all these statements, especially the saying that a Leviathan is prepared for the just and upright. Poor radicals! How blind and narrow-minded they were that they would not understand the broad humanitarian principle underlying these sayings! Are not these predictions a crying protest against the injustices and cruelties marking the present era, where the wicked prosper and the righteous suffer? Are they not a warning to suffering humanity that unless the order is reversed, mankind is doomed? R. Johanan, who correctly understood the meaning of the tradition of the Leviathan, states thus: "The Lord will in the future make a hut for the righteous out of a part of the skin of the Leviathan. The rest He will place on the walls of Jerusalem, and its light will shine forth from one end of the world to the other, as it says, And nations shall walk at thy light, and Kings at the brightness of thy rising." The Leviathan is thus a universal symbol of the new era in which the righteous will prosper and the wicked suffer. The Leviathan, furthermore, is the emblem of the ideal age, when this world will become the home of the righteous. It is an ideal symbol of a new economic order in the world, when righteousness will be one's only requisite for acceptance unto the realm of happiness and prosperity. Every upright and just individual will be rewarded according to his deeds, and in proportion to his faithfulness. Those righteous who, because of external circumstances, will not be able to contribute their mite to the upbuilding of the Kingdom, will nevertheless share in the privileges and joys of the new civilization. [...] This theory of a Utopia of the righteous on earth ean be easily traced in the Apocryphal and Pseudepigraphal writings. In the Book of Enoch, for instance, we frequently find the idea that, in the future era, God will make peace with the righteous who will belong to Him, and who will prosper and be blessed; that for the elect there will be light, joy and peace, and they will inherit the earth; that the abundance of the earth, as well as intellectual and spiritual wisdom, will be given to the righteous and holy; and, finally, that all the goodness and glory will belong to the upright and just. [...] As a result of the new conditions and radical changes, the wicked who will be left, will change their attitude toward life. The glory and happiness of the upright will plunge the unrighteous into sorrow and shame. Rivers of tears will flow from the eyes of the wicked. They will then wonder how they could have led a wicked life; and they will finally acknowledge God, by saying, "This is the Lord, for whom we waited. We will be glad and rejoice in His salvation". The unrighteous will thus praise the Lord, and recognize the teachings and purpose of God in the world. The Lord's compassion will then be moved, and, by putting the blame on the evil inclinations inherent in man, He will allow the newly converted to enter the new order and to share in His glory. They will comprise both Jews and non-Jews. Only a small group, the vilest and most worthless element of mankind, as typefied in the snake of the animal kingdom, will be doomed and cut off forever from the new Kingdom of God. The newly converted proselytes of righteousness will thus be received and put on the same footing with the other members of the new civilization and order. "And the glory of the Lord shall be revealed, and all flesh shall see it together; for the mouth of the Lord hath spoken it." The ideal society of mankind on earth, based on the principles of genuine justice and righteousness will then become a fact. The Messiah idea will be realized. This is the meaning of the burden of the prophets: "But with righteousness shall he judge the poor, and decide with equity for the meek of the land;” I will raise unto David a righteous shoot, and he shall reign as king and prosper, and shall execute justice and righteousness in the land". In other words, in the universal, perfect State, righteousness and happiness will eventually coincide. In the present era, the righteous are never safe. They are hardly tolerated, and are, therefore, always on the defensive. But in the era to come, the upright will constitute the society of mankind. The words of the Psalmist will then be realized: "Thy righteousness is an everlasting righteousness." [...] Once a society of the righteous is established on earth, mankind will be safe. There will be no more danger that the world will go through again the sad experiences of the past, and that it will repeat the grave errors committed during those periods when the unrighteous ruled - periods of hypocrisy, corruption, dishonest politics, accumulation of wealth in the hands of a few, poverty, want, suffering, robbery, murder, wars, and kindred evils. The very atmosphere of the world will be one of a universal paradise on earth, so that the chiIdren born in the new age, will grow up just and upright. [...] The question arises: How will that ideal civilization take root? In an era like ours, when each nation thinks and acts only for its own selfish ends, ignoring the common good and wellfare of mankind as a whole, is there any hope that the nations on earth will suddenly arise from their lethargy, and start a new Utopian life? The answer is: One nation would have to establish its life on a Utopian foundation, thereby leading the way for the rest of the world to follow its example. A model, ideal state comprising a group of righteous individuals and living an ideal life, will gradually spread its teachings and influence from nation to nation, throughout the world. The kingdom of God will then become a fact. Israel is the only nation that is suited for that purpose. The religious experiences of Israel and the ideology of that people as voiced by the prophets, qualify it to lead the world in establishing a universal Utopia. What Tennyson has said of the human race, may well be said of the ideal Israel: "We are the ancients of the earth, and in the morning of the times." The rabbis had wonderful insight into the history and experiences of Israel and of mankind in general; they viewed them from the point af view of God's purpose and of the spiritual forces in the world, and they have correctly and frequently expressed their opinion that the Kingdom of God will come only through an ideal Israel. [...] As a result of their spiritually united front, the Lord will be to the ideal people an everlasting light.186 Similarly, the leaders in Israel will be peacefully united in their responsible task of directing the fate of that historic people. Israel will consequently become the instrument of peace among the nations of the world. The prophecy of Isaiah will thus be realized: Behold, I will extend peace to her like a river. Sixth, Irsael will be a living testimony to the absolute unity of God. Consequently, in the ideal era, there will be no people who will believe in the division of the Godhead into two or more parts, or persons. Only those peoples who believe in one God will survive in the ideal world. Furthermore, the ideal people, by cleaving to God, will be an eternal witness to the Lord, that He is the true God, the living God, and the everlasting King. Indeed, the main justification for Israel's distinctiveness and separation from all other nations, will be that she identifies herself with the living and everlasting God, the Holy One of Israel; that she preserves the memory of her historic experience of receiving the Torah; and that she gives the Torah's ethical teachings to mankind. A Universal State...hmm...sounds interesting...what could go wrong? Don't worry, I'm sure this messianic Jewish Rabbi was just a one off intelligent lunatic who thought the New Jerusalem could be built by mankind and the Kingdom of God could be brought down by mankind to earth through forcing God's hand and murdering all but the 'righteous' and ungodly. Please note: It is startling that this book was written in 1932, just one year before the rise of Adolf Hitler to power in Germany. Anti-semetic feeling appears to be on the increase in Europe. Religious hatred or hatred of any kind towards the Jews is repugnant and should always be guarded against. Entrust the Jewish people, the Middle East and every nation to Our Lord Jesus Christ and the Immaculate Heart of Mary. When it feels like the world is going up in flames, remember that this world is in God's hands, along with the Salvation promised by the Lord. Thank you for digging out this book! When will the third Holy Temple be rebuilt? The old school thinks that will only happen in the distant future, when everyone is united by unconditional love. But that future is now. Today’s youth are already linking arms together and putting aside all differences, ready to rebuild. It is the inspiration of the Holy Temple itself, with its promise of hope and peace that brings together all people in unity. This is the generation that will rebuild the Holy Temple. what about the catholic psychopaths? Well, I guess I am one of those Catholic psychos, who believe that that at the second coming of Our Lord, the Saints will reign with Him. But that's the good thing about being a Catholic psycho. You know that God is God, God alone executes judgement and you don't presume judgement will be executed specifically in your favour. The expectation of such a final judgment on mankind demands a degree of humility. Among the psychos, therefore, Catholic psychos are the least dangerous. that's what the Islamic psychos and the ''Jewish psychos'' and all the other psychos say too, innit? Er, no I don't believe they do, actually. Neither the Jews or the Muslims believe in a Second Coming of Our Lord, you see, in which the sheep and the goats will be divided, some onto everlasting glory and others onto everlasting damnation. We as Christians alone believe this - that He ALONE will judge the nations with justice. We do not claim, at all, that we will do it on His behalf, with an earthly messiah as our captain and leader. Jim - lunatic rabbis and imams do not have the divine Magisterium of the Holy Bride of Christ to expose their lunacy. this rabbi's POV is typical rabbinical madness. Just read any standard conservative siddur or rabbinical biblical 'exegesis' - they haven't a clue about what the books of the tanakh really mean because the truncated books they have are utterly divorced from the reason they were revealed in the first place - Christ. The Jews are seriously misguided or wontanly obstinate - in truth they ceased to be 'Israel', at Pentecost. The Bride of Christ is Israel - this is what the Church has always taught. the old testament (the prophets) has worth as an introduction to the Word made flesh - the Church has always taught this. The true purpose of the old covenant was to purify a vessel (Mary Immaculate) whereby the Word would become flesh, that we may be saved through the Testament of His Most Precious Blood. Something Jews, muslims and new ecumenists deny. p.s. the State of Israel was engineered in order that so-called western democracies have a control tower at the juncture of the Arab states (I know its a fact the creating a homeland for displaced Jews was the catalyst for this). They legalized all sorts of vice for tax reasons as soon as the state was born and have one of the most liberal/dispicable abortion programmes on the planet. The dead covenant's stomping ground is just a strategic and economically very successful strip of land. The only eternally important thing about it is that it is the land which God willed that all the mysteries of the Holy Rosary take place. p.s. actually - I take the above first sentence back. The Truth is that the Magisterium of the Holy Bride of Christ exposes all lunacy and lies what they are. Too bad It is overshadowed these days by people's need to legitimize lunacy and lies. The envisaged "one world order" will come under the auspices of the Talmudic-defined seven Noachide laws. Now, what's really interesting, and can be found on the wikipedia page on the Noachide laws referenced below, is that the US Congress passed a Bill that recognized the Noachide laws as being the "basis of civilized society and upon which our great Nation was founded"***, standing in opposition to what we might have thought to have been the Ten Commandments or the Biblical Scriptures as a whole. U.S. Congressman, Bill Dannemeyer, believes that this Bill now gives legal warrant to the execution of Christians in the US should a hostile administration ever take power. This book is a true "eye-opener", thanks for posting about it. And as st. Teresa de Avila would say "a little knowledge is a good thing"!.. Still nutcase psychopath Jews and Catholics don't use women and children as human shields. "Christians would do well to remember that St. Paul, and the Apostles, thought the Greek version of the Jewish scriptures (Septuagint)was just as authoritative as the Hebrew and Aramaic versions. In fact it can be said they even thought it more relevant to the New Covenant than any other version, as the majority of quoted OT passages in the NT come from this Greek version. Christians would do well to also remember that the word most commonly used for the Nation of Israel in this Greek OT is "Ecclesia" which means literally "a called-out people". It's the exact same word used in the original Greek NT for the Church. In the eyes of St. Paul and the apostles, Israel and the Church were one in the same. This was in perfect continuity with the OT as demonstrated in St. Paul's 'olive tree' illustration, (Romans 11). (this quoted from: "youtube channel", 'coG25', in the "discussion" page. Here it seems to me "Israel" is a spiritual term, or united to the Church and not a political or terrenal "State of Israel". Thanks in advance for allowing me to comment. So I visited an independent pre-Vatican 2, sedevacantist catholic chapel on Saturday. On the cover of the bulletin was a photo of a Spanish statue of "St James the Moor Slayer". The story goes that during a battle with Muslims back in the Middle Ages in Spain, St James descended on a cloud and killed off a bunch of Muslims. The statue actually includes a decapitated Muslim head at its base. The priest there, Fr. Ercoli, is from Argentina. He said that when Benedict issued Summorum Pontificum, Bergoglio, then bishop of the large diocese of Buenos Aires, would only allow Latin Mass to be said in TWO parishes. Just TWO.